In the patio, enjoy the best moments of the day in one of two outdoor lounge. Decorated with the purest Moroccan tradition with quality materials, Dar Salama and its staff will make every effort to get your holiday unforgettable. 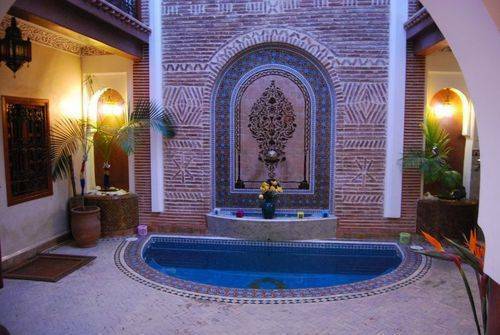 At the foot of the large fountain is this nice little pool, where it is good to relax after the souks and museums. The TV lounge where you can lunch or dine in peace. Dar Salama has the opportunity to offer a course to a meal prepared by the Moroccan yourself. All this in a friendly atmosphere. When you arrive at the Menara airport or at the train station, take a small taxi to the Jemaa El Fna Square. 10 minutes walking along the Berb Dabachi street close to the beautiful mosque Saleh Bin, turn right and then walk ahead and then turn left then a left again and then at your right your will find Dar Salama. Dar Salama is located at the heart of the anicent medina of Marrakech. It is only 5 minutes walking from the famous Jemaa el Fna place.